Since 1995, we have been serving the community by providing farmers with the equipment they need. Being farmers ourselves, we understand the importance of reliable and efficient farming equipments. Proud to be your agricultural and farm equipment dealer in Black Eagle, MT. Our showroom is full of new equipment that has the ability to speed up any agricultural or land management project. Browse our selection of used equipment to save a bit of money while purchasing your next high-quality tool. Congratulations to Shelbi and Tyler! 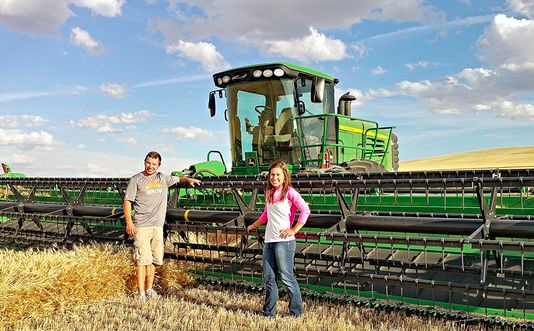 They work together to promote their custom Swathing and custom Harvesting around the state of Montana! "Looking for a conveyor for awhile, with price of pulse's we needed to treat them with care. Just took a chance, stopped in, made a deal and away we went. The same thing happens most times we stop in." "The 2655 Haybuster you sold me is a very nice machine. The price was competitive and thank you for delivering to my area. It's just what you said it would be." "You most certainly came across with a genuine welcoming friendliness and a forthright, honest attitude. Thank you, it has been a pleasure doing business with you." "I love the Bad Boy mower, it works unbelievably well. It was a great experience. Thank you." © Copyright by Sandhills Publishing Company 2019. All rights reserved. Reproduction of material appearing on this Web site is strictly prohibited without written permission. TractorHouse.com is a registered trademark of Sandhills Publishing Company.